Dec 13, 2018 UPDATE: Thank you to all of our 2018 Adopt a Family sponsors! All of the families that registered for the AAF program have now been sponsored! Well done! If you are a sponsor looking to support the Surrey Christmas Bureau, we are still in need of toys and financial donations to assist the families that receive help through the Toy depot. Please consider making a donation by clicking here or drop off toys at our Toy Depot located at 10240 City Parkway. Helping a family in need is always a meaningful experience, but helping a family during the holidays changes their entire experience of this time of year. Imagine the worry that parents feel when they must choose basic necessities over a Christmas meal or special toy. The Surrey Christmas Bureau Adopt-A-Family (AAF) program matches individuals, businesses, and other organizations with a family in need that has children under the age of 18. 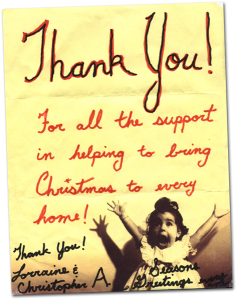 Each year we seek support from 1,000 sponsors so that every family and child in Surrey can celebrate Christmas. By becoming an AAF sponsor, you agree to provide a Christmas breakfast, lunch and dinner as well as gifts for the family you are matched with. Our guidelines and planning list will help you understand expectations and provide some ideas. If you would like to sponsor a family, please complete the sponsor application form or contact the AAF program at (604) 585-9670. For an official tax receipt, mail this AAF In Kind Tax Receipt Request form and all original receipts.